This post is the fourth in a series on vocabulary instruction. Part 1 provided an overview, Part 2 focused on the conceptual base for vocabulary, and Part 3 described the List-Group-Label-Add Strategy. When a mature reader encounters an unfamiliar word while reading, the first move is likely to be to try to determine the meaning of the word from the context. Because they are trying to communicate with the reader, author's typically leave clues to the meanings of the words they are using in the text (not intentionally, but as a natural part of the communication process). Perhaps because this strategy seems so natural to us as readers, we sometimes assume that students will use the strategy effectively, too. So when a child encounters a word she doesn't know in a text, our advice is often, "Skip it, read on, and see if you can figure it out from the context." This is good advice, but not good instruction. As maturing, not yet mature readers, students need help in efficiently using the skip-and-read-on strategy. Authors leave clues in a variety of ways in texts. 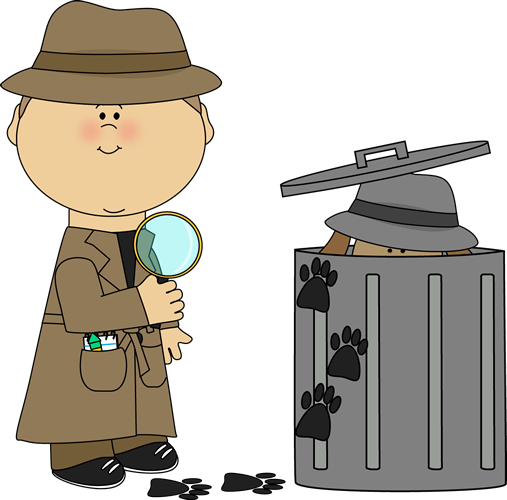 Knowledge about what kinds of clues authors leave and how to identify those clues can help students determine the meaning of unknown words in context. This is a critical skill, since it allows the reader to continue on in the reading without interruptions to look up words, so comprehension is enhanced. It is also critical because it means that readers are building their vocabulary through the act of reading. The chart below shows six ways that authors leave clues in text. Readers need to be able to identify these clues in their reading. The chart is arranged from the most concrete (definition) to the most abstract (mood or tone) clues. Instruction in the use of these strategies follows the same gradual release of responsibility model that I have discussed in previous posts. Here is how I would use this model for context clues. What the teacher might say to the students is in italics. Model the strategy through a read aloud/think aloud demonstration. Let's say that we come across this sentence in our reading: "Unlike her older brother Jerome, who stayed out all hours of the night, Kate obediently followed the curfew her parents set." In this sentence I am unsure of the meaning of the word obediently, to try and figure out the meaning I read the full sentence again including the words that come after the word I do not know. In this sentence, the context tells me that Kate is unlike her brother. I also know that Kate's brother stayed out all night and broke the curfew. So if Kate is not like her brother, is a contrast to her brother, she must be a person who follows the rules. So obediently must mean something like following the rules. Let me reread the sentence and see if that makes sense. If it does make sense I can read on. This modeling can take place over several examples. Give the students opportunities for guided practice of the strategy with partners or in small groups, while you monitor their use of the strategy. Let's now get into groups of three and I want you to work together on the next three sentences to use the contrast clues in these sentences to determine the meaning of the word...While the students work, the teacher moves around listening in, redirecting and coaching use of the strategy. Give students the opportunity to practice the strategy independently. Now it is time for independent reading. As you read today, see if you encounter any words that you do not know and see if the author has left a contrast clue to help you determine the meaning of the word. Checking in with students as they read, the teacher can monitor the use of context clue strategies. This process can be used for each of the types of clues and eventually, the students can practice identifying the clues that they used and the meanings of the words they encounter in the text. Pearson and Gallagher, who developed the gradual release model, warn that teachers should not rush through the collaborative and guided stages of this lesson - this coaching art of the lesson has been shown to be critical for student success. The use of context clues to determine word meaning is a critical skill in reading that not all students adopt automatically. The strategy can be taught, however, and arming students with the knowledge that clues to meaning are available and helping them identify what those clues are, not only aids reading comprehension, but also helps students build their vocabulary while they are reading independently. This post is the third in a series on vocabulary instruction. You can find Part 1: An Overview here and Part 2: Teaching from a Conceptual Base here. In the last post in this series, I discussed the importance of teaching vocabulary from a conceptual base. The idea is that children learn new words best by being able to place them in a conceptual framework, so that they can add new words to a concept they already possess and thus develop a broader, more sophisticated, more specific set of words built around a single concept. Thus a small child may have a rather simplistic notion of the concept pet that may include words like dog and cat, but over time will expand to include many other types of animals and other words from leash to litter box, from domesticated to veterinarian. Vocabulary instruction from a conceptual frame becomes then a process not of learning individual words, but of connecting new terms to already existing knowledge. One of the best strategies I have discovered over the years for teaching vocabulary from a conceptual framework is List-Group-Label, suggested by the great social studies teacher, author, and researcher, Hilda Taba, in 1967. While originally intended for use in social studies and science classes, the strategy can be used in any content area. In my own teaching, I have expanded the strategy to include an opportunity for students to add on words as they continue to read and learn about a concept, so I call this adaptation List-Group-Label-Add. Here is how it works. Choose a word that represents a fairly broad concept. Often these words will be the basis for a unit of study. Water evaporation makes a good concept for this activity, while dew is a word we will encounter in this study, but not broad enough as a concept for our purposes. In the example below, I will use the concept community. Write the target concept on the board: community. Point to the word, say the word, have the children say it with you and then tell the students the meaning of the word. By the way, we should follow this procedure with all new words we introduce to children. Research has shown that student memory for the meaning, pronunciation, and spelling of a word is enhanced if we follow the simple see it, hear it, say it, talk about it paradigm. For this exercise I defined community as "a particular area with all the places in that area and all the people who live there." Next I will tell the students, "Take a few minutes to jot down in your notebook any words or phrases that you connect to the idea of community. For example when we think of community we might think of the fire fighters who help us, but we might also think of the fire house that houses the fire engines. We might think of the public library and the librarians, we might think of houses and apartment buildings. "What do you think of that connects to this idea of community?" After the students have had a few minutes to make their lists, I ask them to share words that they have written. As a students share, I write the words on the board under the umbrella term community. I keep going until I have 25 -40 words on the board. Let's say that we gathered the words in Figure 1 below from the children. After gathering the words from the students, I put a numeral 1 next to one word, in this case police, and ask the children which words they would also put a 1 next to because they have a similar function in the community. After gathering a group of "1s", I move on to group 2 and 3 and so on as illustrated below. This is the grouping part of the activity. See Figure 2 below. Next for labeling, I point out all the words in Group 1(police, fire fighters, crossing guard, minister, teacher) and ask the students to give the group a name. Perhaps we come up with community helpers. The process is continued until all groups have a label (play areas, shopping, public buildings, etc.). The specific labels are not as important as the activity of grouping and looking for commonalities. Once we have grouped the words and labeled the categories, I take the list and organize it into a concept web and display it in the room or on a Smart Board (See Figure 3). As we continue our study and reading about community, we then add any new words that we learn to the concept map, determining which category the new words belong to or adding new categories as needed, New words are written in a different color to show that these words are new knowledge acquired during the process of learning more about the concept of community. After guiding the students through the process in this manner a few times, it is a good idea to turn the grouping and labeling parts of the process over to the students working in small groups to come up with logical groupings and labels for the generated words. As new words are learned, students may find they need new categories or that category names need to be changed to accommodate the new knowledge. This is the second in a series on vocabulary instruction. You can find Part 1: An Overview here. Dr. Seuss or Russ Walsh? There are few things in education that we know with absolute certainty, but one of them is that teaching vocabulary from a conceptual base is far superior to the conventional look it up, define it, write it in a sentence, take a test approach. Despite our knowing this for more than fifty years, the conventional approach continues to be used in classrooms to this day, proving harder to kill than Dracula. What constitutes a conceptual approach to vocabulary instruction? A concept may be defined as an idea of something that is formed by mentally combining all its characteristics and particulars. So the concept global warming includes such characteristics and particulars as pollution, climate, carbon dioxide, ozone layer, greenhouse gasses, carbon fuels, emissions, methane and on and on. Of course, each of these words is its own concept, so vocabulary growth is a continuing process of refining of the characteristics and particulars of an almost infinite number of concepts. The point is that children learn vocabulary best through the linkages that are provided by learning new words around a particular concept. On March 2 of this year I was invited to participate in Read Across America Day in my old school district. In one pre-school class I entered I was immediately identified as the real Dr. Seuss. One clearly very exited child ran up to me and cried, "Dr. Seuss are you going to read to us today?" The teacher, Mrs. Clewall, had shown the children a picture of Dr. Seuss earlier in the week. 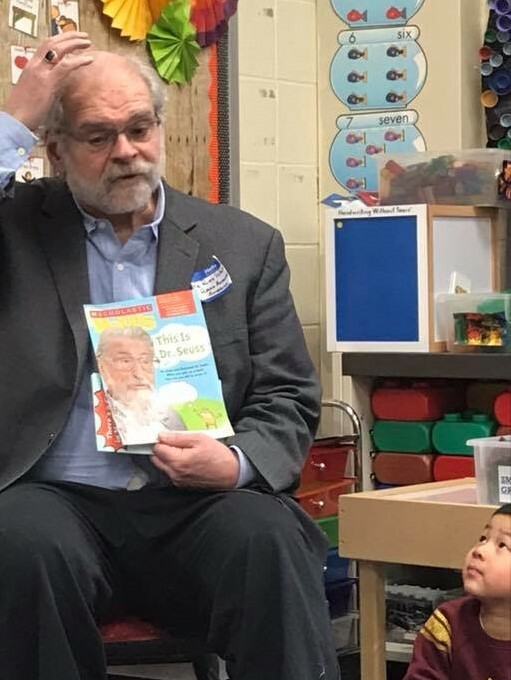 As a result, the children had a concept of Dr. Seuss as an older, gray-haired, bearded man with glasses. I fit the bill. I began the class with a discussion of same and different and the children discovered that while I indeed was an older, gray-haired, bearded man with glasses, I was also different from Dr. Seuss in that I had much less hair, different glasses, and a rounder face. Hopefully, the children's concept of old guys who like to read and write books expanded a bit. In the first grade class I visited I chose to read Zomo the Rabbit, by Gerald McDermott. This West African trickster tale is the story of a clever little rabbit who goes on a quest for wisdom. I decided that I would introduce the story by having the children explore their understanding of three words: smart, clever, wisdom. Clever and wisdom feature prominently in the story, but I began with smart because I thought it would give me the best chance to bring all the children (in a class I was meeting for the first time) into the conceptual area of focus: the pursuit of wisdom. Through a series of sit and thinks and turn and talks the children discussed the three words and came up with some tentative definitions. Most agreed that smart meant knowing a lot of stuff and clever meant knowing how to solve problems. Wisdom was more of a challenge for most kids, but one child volunteered that it had to do with spending a long time learning about important things. With that I read the story to the children. In his pursuit of wisdom, Zomo has to do three impossible things, which he is able to do because of his cleverness, but along the way he also gets his jungle friends, Big Fish, Wild Cow, and Leopard, very angry. He learns that wisdom takes more than cleverness and more than courage, it also requires caution and good sense. After the reading we revisited our three words and the students demonstrated a growing understanding of what wisdom might entail. A little cleverness, a lot of knowledge, some caution, and lots of good sense. This is a sample of what approaching vocabulary from a conceptual base looks like. If we wanted to structure the lesson more formally we might want to employ concept circles to make the connections clear for the students. There are three types of concept circles. The first asks the student to name the concept given the words within the circle. The second asks the student to supply another word that would fit in the circle and help define the concept wisdom. The third asks the students to identify the word that does not fit with the others in defining the concept wisdom. Which one of these is not like the others? Concept circles, and a conceptual approach to learning vocabulary helps kids assimilate new words into already existing concepts, making their concepts more sophisticated and arming them for more and more sophisticated and nuanced understanding and uses of the language. In part 3 in this series, I will continue our exploration of vocabulary instruction from a conceptual base. The first in a series on teaching and learning new words. The importance of a strong vocabulary to successful reading is well-documented. Because of its importance vocabulary development is considered one key to a rich language arts curriculum. But while there are many paths to an increased vocabulary, there is no silver bullet, no magic formula, no quick fix for vocabulary. Vocabulary development is the work of a lifetime, a literal cradle to grave activity, a quest that has no end. As teachers our job is, in part, to teach vocabulary, but more importantly it is to set students up to be in the vocabulary acquisition business for the rest of their lives. First, let's take a look at the many paths that lead students to a rich vocabulary. Conversation - Children, from the earliest of ages, learn words through conversation with adults and other children. Children who are talked with, rather than talked at, tend to build larger vocabularies. In the classroom it is critical that teachers have real conversations with children and structure the classroom so that children can have real conversations with each other. Conversations are two way streets where participants are expected to listen and also speak. Reading - Before children learn to read independently, they learn new vocabulary through read alouds. Once children learn to read independently, wide reading in a variety of genres and on a variety of topics is the single best way to continue developing word knowledge. Read alouds, with teacher explanation of words, should, of course, continue well after children have begun to read independently. In order for reading to lead to improved vocabulary, that reading must be wide awake to the new words the reader encounters. In other words the reader must have a well-developed word consciousness (see below). Writing - Truly knowing a new word requires many encounters with a word. One good way to reinforce vocabulary learning that comes from reading or direct instruction is through writing. Please note, I am not talking here about writing sentences for words that have been assigned arbitrarily, or the kind of artificial writing created when students are asked to use a set of vocabulary terms in a paragraph. 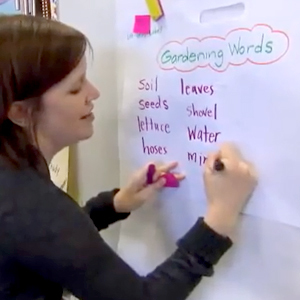 I am talking here of a much more organic approach, where children reinforce new vocabulary by responding to or summarizing what they have read or what new information they have learned. The point of learning new vocabulary is not the words themselves, but the ideas these words convey. Direct Instruction - Research has shown that students can also learn words through direct instruction. Again, direct instruction does not mean being assigned a list of words to look up, writing the definition, and then writing the word in a sentence. This is not instruction at all, but busy work. Direct instruction means the teacher deliberately discussing a targeted word, talking about its meaning, showing how it is used in context and engaging the children with the word by showing how it connects to their own experience. Morphemic Analysis - Knowledge of root words, prefixes, and suffixes can also assist students in determining the meaning of a word and in building vocabulary based on common elements. It is helpful when you run across the word "pseudonym" in your reading, if you know that the prefix "pseudo-" means "fake" , and that the root "nym" means name. This knowledge can then help you extend to other words like homonym, synonym, and antonym. Context Clues - Knowing that authors often leave clues in their writing to help readers determine the meaning of an unknown word is also useful in developing vocabulary. Research has indicated that the use of context clues is most effective when students are directly taught the strategy and the various ways that authors signal the meaning of words. 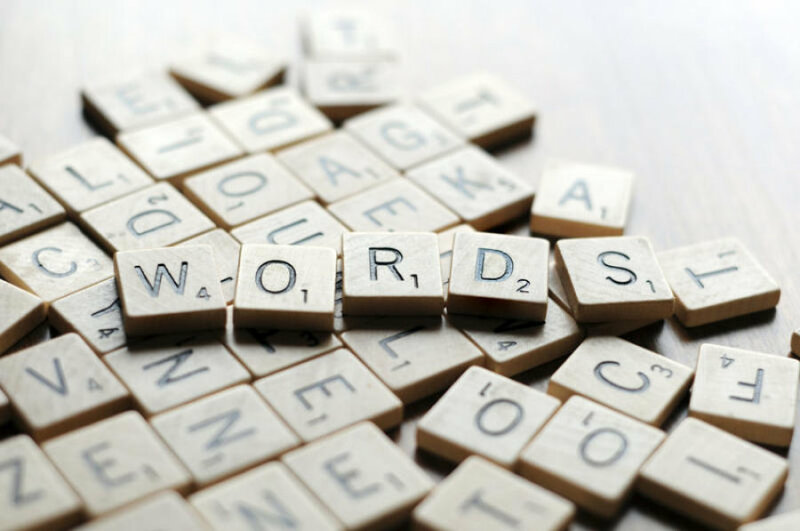 Word Histories - The history of words can also be helpful when trying to determine the meaning of a word. Telling word stories can help students develop an interest and curiosity in words. One such story I tell is about the word "sign." It seems that the word sign was once pronounced with the "g" being sounded, but over the years the "g" was dropped and the "i" made long. But the "g" has been retained in spelling to help us with the meaning of such words as signal, signature, signatory, significant, etc. Consulting an Expert - Sometimes no particular strategy can help and outside help is required. Students need to learn to use resources like a dictionary quickly and efficiently, but I also like to suggest that students should consider other resources that might be available as well. It might be more efficient for the reader to simply ask a classmate (perhaps one with particular knowledge of a particular topic), or the teacher, or another adult. Just as readers need a repertoire of strategies to decode an unknown word (phonics, word families, chunking, what makes sense? ), they also need a repertoire of strategies to determine word meaning. Indeed, any encounter with a new word might involve a bit of recall of instruction, a bit of morphemic analysis, a bit of context, and a bit of consulting an expert. Teaching students these strategies is helpful, but we also need to make sure we teach them to use the strategies flexibly. None of the good vocabulary instruction we do will matter much unless we simultaneously help students develop word consciousness. Word consciousness means an awareness of and a curiosity about new words that will motivate the learning of new words. I have written about word consciousness extensively in this post. Teachers have a critical role to play in developing student word consciousness. First, and most critically that role includes being a model of word curiosity. During read alouds and any other activity, the teacher must communicate her fascination with, enthusiasm for, and love of words, at the ingenious ways that words work, at how the same word can have so many different meanings, at how authors choose to use certain words to communicate certain ideas. By skillfully and regularly using think alouds teachers can help students develop their own fascination and enthusiasm for words. Here is an example of a think aloud from a fourth grade read aloud. From the reading: The truck farm is located on a beautiful stream in a pastoral setting. Boys and girls, I am not sure I know the meaning of "pastoral" in this sentence, so let me see what I can use to help me figure it out. I know that the suffix -al is used on adjectives, so the word is a describing word for the noun "setting." If I take the -al off I am left with the root word "pastor." I know a pastor is kind of like a minister or a priest, but that meaning of the word doesn't seem to make sense here. "Pastor" also looks a bit like "pasture", and this sentence is talking about a farm, so I wonder if the word could mean something along the lines of "like a pasture." That seems to make sense. Let's look the word up and see what the dictionary has to say. So the dictionary says "associated with the country life." So that seems close to what we guessed. The dictionary also says that this is the type of farm is usually associated with sheep or cattle. The word comes from the Latin word pastor meaning shepherd. That also seems to be where the word "pastor" meaning minister comes from, because religious pastors are often referred to as tending to their flock, in this case, not sheep, but the people who attend their church. In this think aloud I have tried to demonstrate for the children that they can use context clues, morphemic analysis, word histories, and outside experts in combination to discover the meaning of a word and to get the bonus of discovering some interesting ways that words are intertwined in meaning. Armed with word consciousness and some word solving skills, students are positioned to grow their vocabulary with each encounter with text. In future posts in this series, I will look in more detail at other instructional strategies we can use to build vocabulary.